Greetings, everyone! We hope to find you a good shape. In today’s article, we shall review the daily habits that are of utmost importance for your dental health. These will have a good impact on your teeth’s health and appearance, so be sure to pay attention. The first one, as always, is going to be brushing due to its importance. 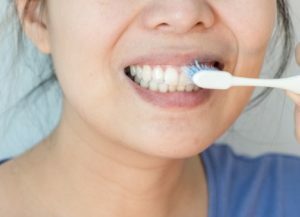 According to our Los Algodones dentists, brushing is our number one go-to way of removing plaque and food residue from our teeth. Also, if done right, brushing helps a lot at preventing gum disease. This is because you can tilt your toothbrush a bit so that the bristles brush the tooth-gum intersections. In those spots is very common for plaque to hide and buildup. When should you be brushing? Before and after sleeping are the best times. It is always recommended to brush at least twice a day so that you can keep bacteria at bay. It is also recommended for each brushing session to last at least 2 minutes! Now we have dental floss, which not so many people carry out every day. Flossing helps getting to the tight places between the teeth that the toothbrush has problem getting to. As such, all that plaque and even pesky food that gets stuck can be easily getting rid off by making use of dental floss. Thanks to its thin and long shape, it is perfect for sliding in-between our teeth, helping us battle gum disease. Also, it should be noted by our Los Algodones dentists that you should be careful not to snap the thread, as it can harm your mouth. As to when is the best time to floss, well, that is up to you! Experts say that whether you floss before or after brushing, it yields the same results. Personally, I choose to floss after brushing, as I like to make sure those tight spots are cleaned to the end. There are so many advantages to be gotten when we use mouthwash daily. 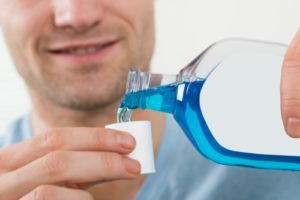 By rinsing our mouth with mouthwash, besides getting a fresh, minty breath, we are helping our mouth get rid of bacteria and food that might be stuck. This is extremely helpful when we are outside where a toothbrush is not accessible. It is worth mentioning that there are two types of mouthwash in the market: cosmetic and therapeutic. Cosmetic mouthwashes just mask smells and provide a fresh breath. Therapeutic ones, however, help treating problems and are the ones you should be getting. If you have gum disease, recurrent tooth decay, or want to prevent tartar, then a mouthwash can help you with that! A very important item when you want healthy teeth. Drinking water on a daily basis, and as such keeping yourself hydrated, also brings more benefits than you would normally think. Water is essential to keep the body functioning, with that in mind, our mouth needs its water in order to maintain its moistness. Thanks to this is that we are able to eat, talk and speak without issue. It is also a good countermeasure against xerostomia. Xerostomia, or dry mouth, is when the mouth does not produce enough saliva. This leads to many complications such as tooth decay and bad breath. So to wrap it up, we have: brushing, flossing, mouthwash and staying hydrated. By doing these four things every day, you will be set on a pretty good road towards a better smile. Though do not forget to schedule a visit with your dentist every 6 months! That way you ensure nothing goes under your nose. No Replies to "The Importance Of Daily Habits"